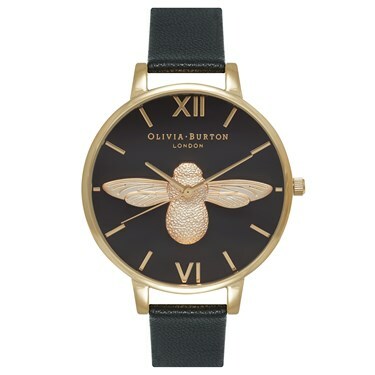 Olivia Burtons classic moulded bee motif has been given a modern edge thanks to the stylish and elegant black dial on this timepiece. This big dial watch measures 3.8cm across and comes complete with a genuine black leather strap. The combination of black and gold will never go out of style - grab this watch to bring a buzz to your everyday look! Quick delivery service!! The watch is super nice!